A Pareto Chart is a vertical bar graph showing problems in a prioritized order, so it can been determined which problems should be tackled first. Choose the categories (or "problem areas") to collect data for by brainstorming, or use existing data to look for these problem areas. The data you analyze must be "counts" (Attributes data) or costs, and must be additive. Data should as yields or percentages cannot be added, so are inappropriate for Pareto analysis. You should also decide the time period over which the data should be collected. 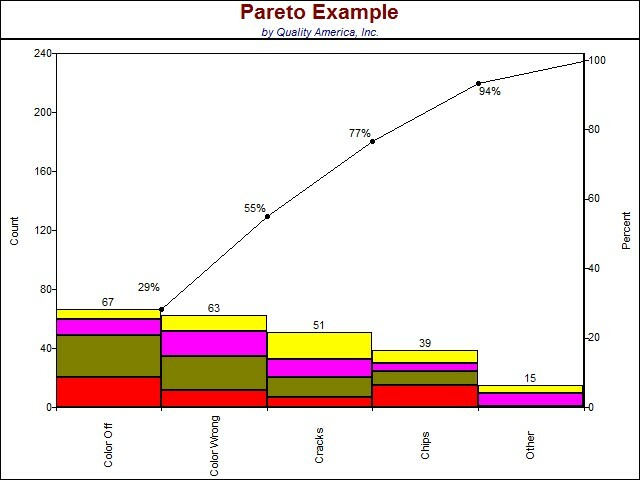 Although the height of each bar provides the primary focus of the Pareto analysis (i.e. the highest (left-most) bar indicates the highest priority), it is sometimes useful to understand the impact of sub-categories within each bar, such as shown in the figure above.